Steam showers are one of the best inventions that have ever been conceived. You get to combine the power of a shower with the benefits of a sauna, giving you an excellent way to start a day, get refreshed after a tough workout, or just wind down as you get ready for bed. In order to find the best steam shower that will work in your home, you need information. This chart will let you quickly compare and contrast the top makes and models so you can find the perfect shower today! In its basic form, a steam shower is a way for someone to bathe with the water vapor that one would typically expect to see in a steam room or shower. The vapor is dispersed around the person in the shower, yet also includes the typical shower fixtures you’d expect to see in the modern restroom. The steam is produced by a separate generator, while the shower fixture hooks into standard plumbing. How easy is it to start a steam shower? You literally just have to push a button in most instances. You sit down on a bench inside the shower enclosure and let the steam embrace you. Some generators allow for essential oils like eucalyptus to be included with the steam so you can feel even more revived. In the typical setup, there will be digital controls inside the shower that send commands to the generator that fits under most sink cabinets. It’s about the size of a breadbox and will channel vapor into your enclosure. Although it seems like a steam shower would consume a lot of water, it really does not. For a 20 minute steam, you’re actually consuming about 2 gallons. In comparison, you’ll go through 2 gallons every 60 seconds for your typical single-head shower fixture! This gives you a lot of options: take the steam, have a regular shower, or enjoy both and really prepare for a stressful day… or wind down from one! What Are the Advantages of a Steam Shower? The primary benefit that owning a steam shower brings to a home is flexibility. Instead of having to go to a steam room at the local gym and sharing the space, you can just crash at home after a hard day for a few minutes and become rejuvenated. Even just 10 minutes is enough to get past the afternoon wall that we all face and that only takes 1 gallon of water! The heat and humidity of a steam shower also help to open up the pores of the skin so that you can get a deeper, more beneficial clean. There is a lot of congestion down in those pores that just won’t come out under normal circumstances – even if you’re an excellent scrubber and exfoliater. The dead skin cells, bacteria, and trapped dirt come to the upper layers of the skin and provide a clearer complexion when used regularly. Steam showers are an excellent treatment for respiratory infections, especially for childhood ailments like croup. You can quickly open up breathing channels and ease problematic symptoms. It’s not just for the kids, however, because the best steam showers also work with sinus issues, laryngitis, and even some cases of asthma. The final benefit, however, is that steam showers are proven to reduce emotional and physical stress symptoms. The hot steam works to increase circulation throughout the body and this expands muscle tissues that release the tightened knots you can feel. It also releases endorphins that cause mental relaxation, saving you an expensive trip to the spa. What Is the Best Steam Shower For Me? Here’s the good news: just about any steam shower will work in your existing bathroom. Most steam showers work best with a ceiling height of about 8 feet, so if you have a taller ceiling, you may want to look for a steam generator that has higher ratings. You’ll want to have enough room in your bathroom where you can sit within the enclosure comfortably if you’re not planning on taking a shower. Steam showers come with a variety of styles and features, but your first choice is going to be between an acrylic shower or a fiberglass one. Acrylic steam showers are a lot easier to clean and maintain, but the porous material of the fiberglass can give you added strength. Look for an aluminum alloy frame if you need a lot of strength, but you’ll usually pay more for this. Recycled materials and other metal combinations, as well as plastic framing, is also available. Measure out your space and then select the right combination of features, framing, and configuration that will work to meet your needs. Be sure to reference our helpful chart and reviews to weed out the contenders from the pretenders! What Are the Prices For a Steam Shower and Generator? 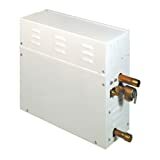 If you’re on a budget, then there’s some more good news for you: a generic steam generator of 6kw can be picked up on Amazon right now for less than $300. The average price of a steam generator, however, is about $900 and top models may run for $1,600 or more depending on the size of the generator and the digital features that are included with it. In most instances, the steam shower enclosure unit is going to cost about as much as the generator will. A sliding door steam shower enclosure, for example, retails for about $2,300 right now. These prices may exceed $4,200 in some instances, depending on the size and shape of the shower you’re working to install. What Do Our Reviews Have To Say About Steam Shower Units? 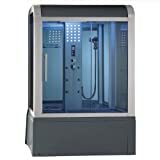 For most people, this Ariel steam shower unit is going to be the perfect shower enclosure to purchase for their existing bathroom. It offers 6 body massage jets and a wooden floorboard that provides a warm, relaxing feeling when you step into it. The steam generator is built into this model for your convenience. The configuration of the shower is a little confusing since the drain sits up off the floor and you funnel piping into your room’s drainage, but that’s a small price to pay for the wonderful results you’ll get with this steam shower. Click here to compare prices on Amazon and get the best deal on the Ariel Steam Shower Unit. This steam shower unit comes with a 3kw generator and a built-in seat for your convenience. It’s ETL certified and offers blue glass for a unique look in the bathroom. The entire unit looks a little futuristic in style, making it perfect for the modern home! It works off of a standard 110v powered system with 30 amps and the glass is tempered. 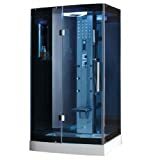 The unit itself is an acrylic and fiberglass combination and offers 6 body massage jets and a rainfall ceiling style of shower that works well for relaxation. Click here to compare prices on Amazon and get the best deal on the Pacifica Jetted Steam Shower and Shower Enclosure. This corner steam shower unit is a beautiful addition that will work in virtually any space. It offers acupuncture massage through 6 jets and the 3kw generator has a cleaning function associated with it. The ceiling provides the shower in a self-described “Amazon” rainfall style, but it’s the computer control panel that grabs your attention. With a timer included, you can set the perfect amount of aromatherapy! Just be careful in older homes – this steam shower will soak up your amperage fast. Click here to compare prices on Amazon and get the best deal on the Eagle Bath Steam Shower. This beautiful steam shower unit offers 8 relaxing jets that will help eliminate virtually all of your stress in just a few minutes. It works on 110 volts with 50/60 hz ratings. The tub itself can hold 80 gallons of water and the steam is powered with a 3kw generator. It has a built-in seat, but the handheld shower unit is the nicest feature of all with this particular shower. Step into it after a hard day at work and you’ll be ready for a full night out on the town in 10 minutes or less! Click here to compare prices on Amazon and get the best deal on the Whirlpool Steam Shower. For a traditional, contemporary look for your new steam shower, this is definitely the item you’re going to want. It offers a rainfall experience that will give you plenty of coverage. The steam system is compatible with aromatherapy options so you’ve just got to put in your own oils and you’re ready to go. The glass is tempered blue and 6 mm thick for added durability. 12 acupuncture massage jets compliment the two showerheads so that you can enjoy a double shower if the mood strikes. It’s all backed up with a 2 year parts warranty and you’ll get two attached seats that fold up. Click here to compare prices on Amazon and get the best deal on the Eagle Bath Blue Steam Shower. What Do Our Steam Generator Reviews Have To Say? Many of the steam generators that you’ll find in the all-in-one shower units are 3kw units. This generator by Kohler will give you triple the power for your bathroom experience! It also works much more quickly than a standard generator, having steam ready in about a minute. With PowerClean technology, you can automatically clean the generator with one-touch convenience and works in showers that are as small as 113 cubic feet. It is definitely one of the best on the market today! Click here to compare prices on Amazon and get the best deal on the KOHLER Fast-Response Steam Generator. If you’re looking to step up the power of your steam shower, but don’t want to kill your budget by doing so, then this generator is definitely a viable option. It works in steam shower units up to 220 cubic feet in size and has a max amp rating of 29. It’s powered on a 240V line and offers 7kw of production for you to enjoy on any given day. It can be installed up to 25 feet away from the shower and is made from solid stainless steel. It’s also backed by a limited lifetime warranty. Click here to compare prices on Amazon and get the best deal on the Steamist 7kW Steam Generator. Do you want a steam generator that will give your precision temperature control? Then this is one of the first generators you should consider. It offers removable and fully serviceable heating elements that operate with an integrated time cutoff feature. It is made from recycled stainless steel inside and out and works with a microprocessor that controls the unit based on your instructions. It’s an efficient unit that produces steam quickly and will provide you with the long-term relief you want. Click here to compare prices on Amazon and get the best deal on the Mr. Steam Steambath Generator. 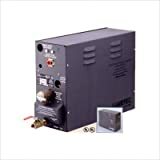 If you’re looking for one of the most affordable and powerful steam generators on the market today, the value ratio you’ll receive with this particular generator is outstanding! It’s an 11kw generator that offers 500 cubic feet of range. With 46 max amps on a 240V power supply, this generator is perfect for a room that needs to compensate for heat loss. Brass threads help to support the water lines, giving you a fast result that can give you a full room of steam in about 5 minutes. This one definitely has a lot of value! Click here to compare prices on Amazon and get the best deal on the Steamist 11kW Steam Generator. As one of the few generators that offers soft steaming options, this might be a small generator but it is a mighty one! With 7kw of performance, you’ll be getting steam in 60 seconds or less once you turn it on. There are also cool touch steam heads that help to provide a safer user experience in bathrooms that are upgrading to this unit. It’s an extremely reliable generator and one that you will definitely enjoy using on a daily basis! Click here to compare prices on Amazon and get the best deal on the Amerec Steam Generator. How could a steam shower change your life? With the best steam shower units and generators, you can quickly upgrade your current bathroom or install a new unit to gain the many health benefits that regular steaming can provide. Take a few moments, look at your options, and use our reviews to select the unit or generator that will best work with your home so that you can enjoy steam showering too! Have you a stockist in the Rep of Ireland, plz ? Sorry we do not have one.